Make Vinaigrette: Place orange peel, lime peel, garlic, mustard, orange juice, lime juice and vinegar in medium bowl; whisk to combine. Slowly add half of the oil drop by drop to juice mixture, whisking constantly. Continue whisking and add remaining oil in a slow stream. Blend in 3/4 teaspoon salt and 1/4 teaspoon black pepper; set aside. Sprinkle scallops with 1 teaspoon salt and 1/2 teaspoon pepper. Spray large skillet with cooking spray. Heat over high heat until hot. Place half of scallops in skillet and cook 2 to 3 minutes on each side or until opaque and firm to touch. Remove from skillet and keep warm. Repeat with remaining scallops. Toss greens with vinaigrette. Place equal amounts of greens on 6 dinner plates. 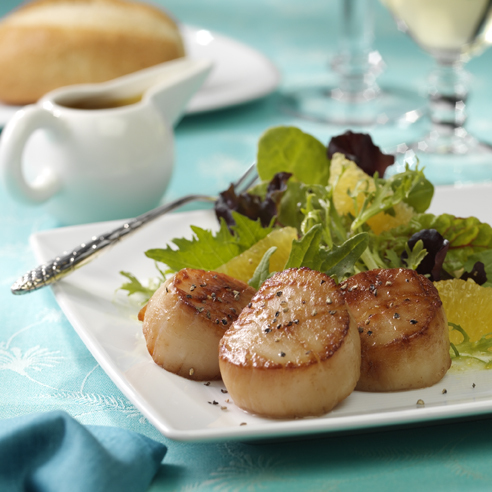 Place 3 scallops on the side of each salad; garnish with orange segments. Serve immediately. Unsure of how to pick fresh scallops? Fresh scallops are creamy beige to light pink in color. They should have a sweet pleasant smell and be almost dry to the touch.